You are here: Home 2011 October Why Cisco 6500 Series is Here to Stay? Tried and true isn’t a descriptor awarded lightly. It’s earned only after emerging battle-hardened from the front lines. It doesn’t matter if you’re the only survivor of the super-soldier program, or the flagship switch in the armada that is Cisco – history speaks for itself. For just a moment let’s take a quick look at that history. The Cisco 6500 was debuted in 1999 at the end of a decade that brought us legends such as Pogs, Street Fighter 2, and the Macarena. Even the popularity of the internet was only beginning to catch on. We began with the Supervisor 1 and its 32gb switch fabric. Next, we graduated to the Supervisor 2 still at 32gb but with the ability to go to 256gb with the switch fabric module. Then we got the Supervisor 720. 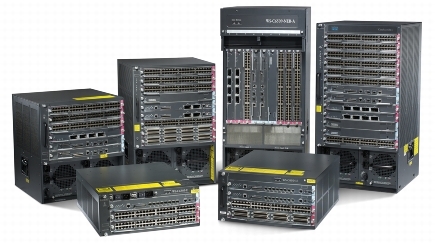 The 720 introduced 720gb switch fabrics, and then eventually the VSS (virtual switching system) which expanded even further to an upwards of 1.4Tbps! Now, Cisco has debuted the Supervisor 2T which grows the upwards limits to 2Tbps, and doubles the per slot bandwidth from 40gb to 80gb! In addition to the newer supervisor engines, the chassis has also evolved. Now with the E series chassis, the Cisco Catalyst 6500 is capable of supporting the larger wattage power supplies and the newer supervisors and line cards. While it looks the same, these subtle differences help push the platform into the next generation. What does that mean for the future of the Cisco 6500 platform? Well with the announcement of new non-blocking 10gb cards and mention of 40gb support coming, it means that the Cisco 6500 series is here to stay. Some are saying it’s here to stay for another 10 years. Bold words from an already aging platform. However, I’m reminded of the old adage “if it ain’t broke, don’t fix it.” The Cisco 6500 switch was built around the idea of expandability, and dependability. It has proven itself time and again in both arenas. So what does this mean for people who purchase pre-owned network hardware or are interested in the Catalyst 6500 switches? It means that purchasing a Cisco 6500 is an investment, and a wise one at that. For people that already have the platform? Knowing that Cisco is only continuing to develop for the 6500 platform is peace of mind that your budget dollars were spent well. In addition, new cards and expansions mean price drops and pre-owned market availability on current cards like the Supervisor 720′s and 6700 series line cards in the not too distant future. Cisco engineers like me are ready and willing to help you talk through your 6500 growth, and the needs and requirements that come along with it. We can help you navigate the sometimes slippery slope of your network hardware upgrades and save you time and money along the way. We’d be happy to chat more in depth on the topic! All things considered, the best just keeps getting better. The Cisco 6500 is here to stay and no one should feel bad about having this shield-slinging super-hero anywhere in their network. After all, it takes a veteran to show the new guys the ropes. It still has its uses, but IMHO the highly oversubscribed, high latency networking architectures of the past won’t make sense in the modern Data Center even at the access layer. Even looking at newer Cisco products like the 5548, let alone even higher density products from companies like Force10, Juniper, Brocade and Arista, which have substantially higher densities, substantially lower cost per port, substantially better performance across the board. Not to mention they all use a tiny fraction of the power and space and emit a tiny fraction of the heat.